A few weeks ago I had a Marvel day at the movies with some friends. We saw the new Captain America and Amazing Spiderman movies. It was a fun day, watching attractive men in tight outfits save the world. We started the day with Spiderman fighting off several villains and ended with Captain America fighting the Winter Soldier. I do love Spiderman, but The Cap is where it’s at. I mean, he’s lived in two time periods and been a hero to both… He’s devoted to his work, and the people he loves, and he is pretty humble to boot! To be honest though, it’s probably not so much Captain America as it is Chris Evans… But I digress. 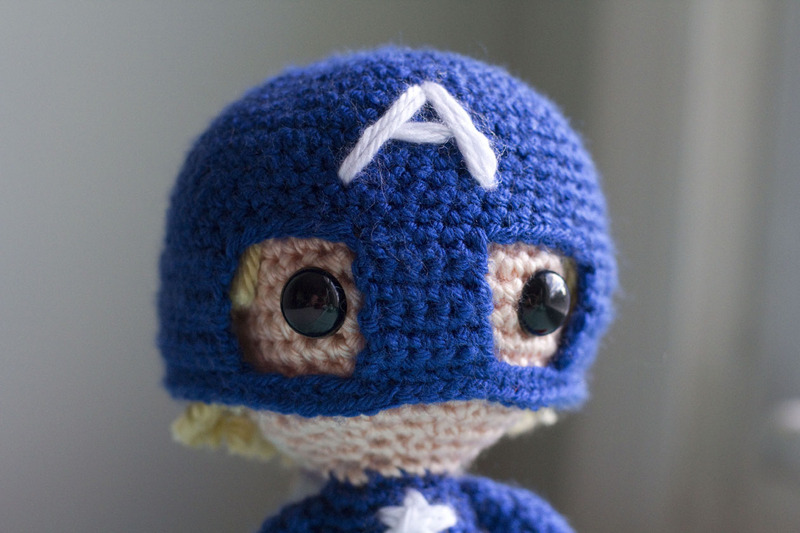 My amigurumi obsession really took hold about two years ago, when The Avengers movie came out. I was struck with an idea to make adorable dolls of all the Avengers, including the villainous Loki. Inspiration came in the middle of the night and I was actually woken up by my brain yelling at me to take action. So I drew chibi versions of all the characters and then went back to bed. It was a productive night! The next day I embarked on this new adventure of creating my own amigurumi dolls and patterns. Several weeks, oodles of yarn, clouds of stuffing, and piles of safety eyes later, I had assembled my own mini Avengers team! Unfortunately I didn’t finish writing out all the patterns before I moved to Japan. Of the patterns I did finish (Captain America, Loki, and Iron Man), I will be posting them here for your own crocheting pleasure. For now let’s start with my favorite, Captain America! This pattern is for personal use only. Please do not sell the pattern or the doll created from this pattern. Thank you for understanding and please enjoy! 18 May	This entry was published on May 18, 2014 at 08:18 and is filed under . Bookmark the permalink. Follow any comments here with the RSS feed for this post.